The A Little Bit of Bling Sweepstakes is open to legal residents of the fifty (50) United States and District of Columbia, who are at least eighteen (18) years old. The A Little Bit of Bling Sweepstakes ends at 12:00pm EDT on October 3. Participants may enter by visiting jewelers.org/news/jewelry-contests/blingsweeps and fully completing the Sweepstakes registration form. Limit one (1) entry per entrant. There will be one (1) Prize Winner. The Prize Winner will receive a pair of small 18k golf Mogul medallion earrings by Syna. The Approximate Retail Value of the prize is $1,000. 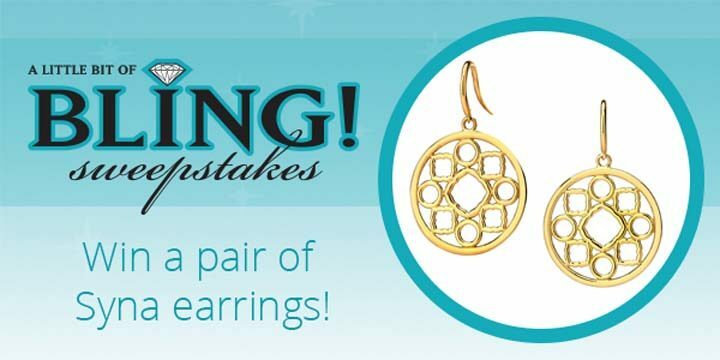 I would love to win these beautiful errings for my wife she would love them.